The mashup: The simple name belies the complexity of this burger, so we’ll break it down for you. Tym Bussanich took a large onion ring, wrapped it in bacon, filled the center with beef, then battered and deep fried it. And that’s just the patty! Here’s a video if you want to see how the sausage burger was made. The way he spreads the batter around with his fingers makes us feel funny. Staying power: Low. This was just one of the creative inventions Bussanich uploaded to Instagram that day. The second was a hot dog where the bun was carved from a single potato and then battered, crumbed, and deep fried. He may have won our everlasting admiration that day, but for Bussanich it was probably just Monday. 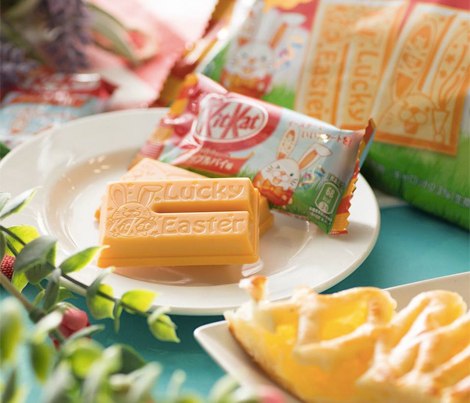 The mashup: Limited-edition carrot and apple pie Kit Kats—the brand’s first ever Easter flavors—went on sale in Japan this week. According to the Daily Mail, they were a direct result of market research—in other words, fans (a lot of them, apparently) specifically requested that Nestlé make carrot-flavored chocolate. 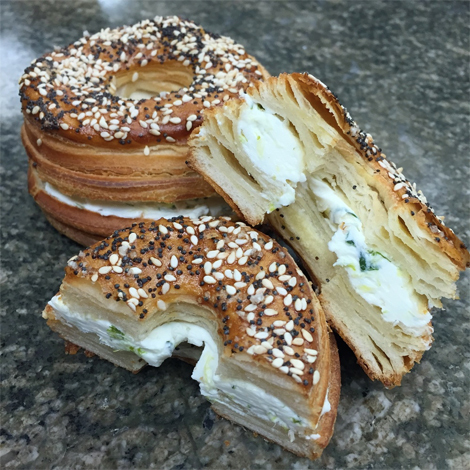 The mashup: The frenagle looks a lot like a bagel (and a Cronut), but it’s lighter, crispier, and made with way more butter. What you’re seeing here is the original poppy-and-sesame-seed version with a scallion cream cheese shmear (*drool*). But there’s also a maple-walnut frenagle with cinnamon-raisin cream cheese, and a black-sesame version with vegetable cream cheese.